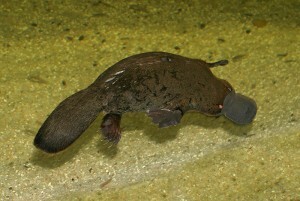 The elusive and evolutionarily awesome platypus. Photo: Stefan Kraft, wikipedia. Click to see photo in its original context. Mammals can be divided into two major groups, the placental mammals, and the marsupials. Marsupials (animals like kangaroos, possums, and koalas give birth to their young earlier and then raise them in an external pouch until they’re big enough to handle the real world, while placental mammals (humans, mice, cows and everything in between) don’t give birth until their offspring are more fully developed. The first fossil evidence for both groups of mammals dates back ~120 million years. The two groups account for almost all the mammal species found in the world today. There are, however, 5 exceptions. Four species of spiny ant-eater (or echidna*), and the platypus. The ancestors species have been evolving for just as long as other mammals, but split way from the ancestors of all other mammals long ago. So comparing placental mammals and marsupials to echidnas and platypodes* gives insight into what features of mammals and their genomes evolved early on in the animals that would go on to becomes the ancestors of all living mammals, from the platypus to ourselves, and what characteristics only evolved after our two lines split apart. This was one of the reasons it was so exciting to read about the publication of the platypus genome two years ago. 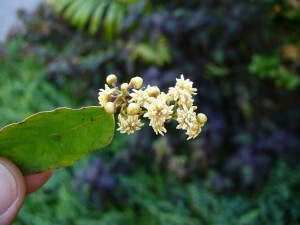 The flowers of Amborella trichopoda. Photo: scott.zone, flickr. Click to see photo in its original context. The family tree of flowering plants is in many ways similar to mammals. It is dominated by three large groups of species that split apart ~140 million years ago.The eudicots (like placental mammals, this group is so large and diverse it’s easier to talk about the species that are NOT eudicots than the ones that are), the monocots (species like bananas, pineapples, grasses, and orchids), and magnoliids (source of many exciting spices, like cinnamom, black pepper, and nutmeg, although the magnoliid it’s easiest to picture from the grocery store is the avocado.) And like mammals, there are a few species that don’t fall into any of these giant groups of species, but split off onto their own evolutionary paths early in the development of flowering plants. The most ancient of these in a species called Amborella trichopoda. Amborella grows only in New Caladonia, group of islands east of Australia, smaller than New Jersey with a population the size of Lincoln, Nebraska. And people complain that the platypus is elusive and hard to study! Next, they plan to sequence Amborella, which should show more clearly whether genome duplication occurred 130 million years ago in the common ancestor to all living angiosperms. To which I say: Awesome! Can’t wait to read the paper and play with the genome! And… please hurry? **I looked it up and platypodes is one of the accepted purals of platypus. ***Tetraploidy in maize that I study is 5-12 million years old. The tetraploidy the Soltises study in Tragopogon is ~80 years old.